Gathering themselves, the legendary Ravingers set out from the famous tavern “Ol’ Shankies” for the last time. But that’s another tale, for another time. 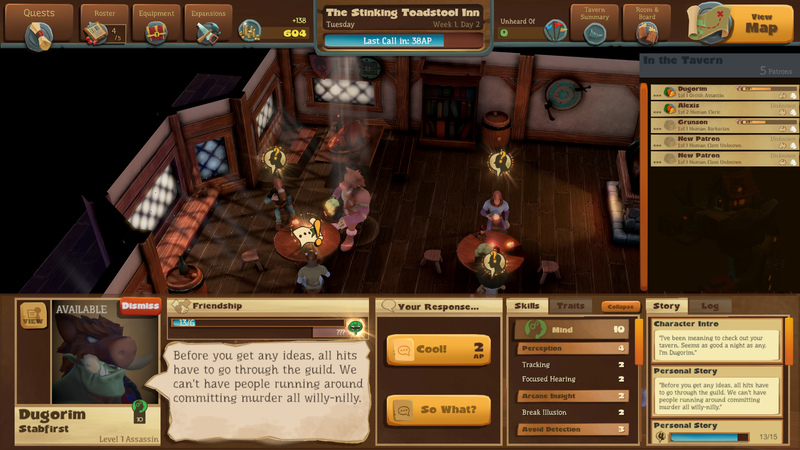 Epic Tavern is a fantasy adventurer management game. It takes influence from all over the fantasy genre, and blends them into one hilarious experience. If you’ve ever played Red Dragon Inn and wished to be on the other side of the ale soaked counter, then this is the game for you. As all classic adventures start, Epic Taverns begins by getting together a band of adventurers. Hopefully they can sort out the fiendish rat problem that the local tavern has been facing. Margal and Grunson, the only barflies left in my drinking hole, made their way downstairs. Only to be trounced by the dangerous rodents and had to retreat back to the dimly lit safety of the bar. It would take another day before they would be able to try their hands at these pesky pests once more. It takes some time for Margal and Grunson to clear out the cellar. By then, a whole menagerie of would be heroes, shifty thieves and other degenerates have appeared. Keeping them topped up with fairy water and stale bread keeps them satisfied for a while. But soon the rumours of a magical teleporting winery start to spread amongst the patrons. Margal and Grunson set out once more. And the tavern begins the process of repairing and expanding that will compel you to continue to take one more turn. Every time. Rodents of unusual size are reanimated by a dreadful necromancer. But a bit of silver-tongued charm not only encourages her to stop but to join the party as well. A stern lecture from Grunson allowed a child from a never-ending circus to escape and join the troupe. Hopefully Hyperkinetic Studios can keep this level of quality up over a larger ensemble of characters. Too many only offer up a “Backgrounds to come!” quote once befriended. The management part of the game is exactly as complex as It needs to be. 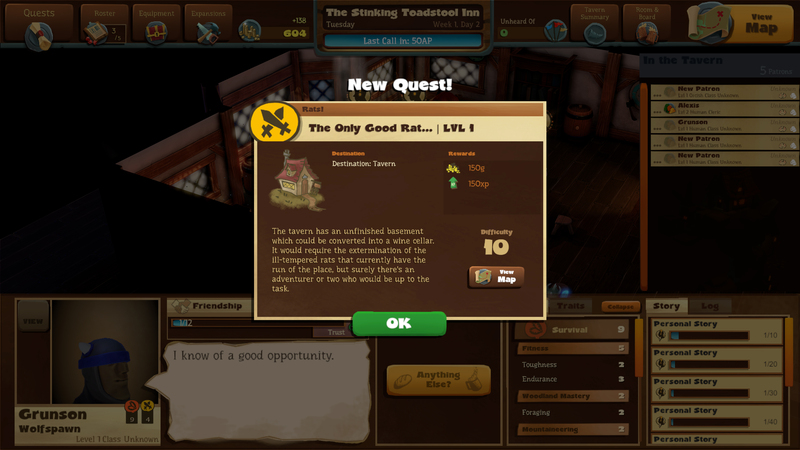 Keep prices low and the patrons you lure into the tavern will be quicker to offer up quests or befriend you. Keep prices high and you’ll be able to expand more aggressively and offer up a larger selection of items to sell. It’s not overly deep, and there’s a definite lack of items to go around. It’s a real shame too as you’ll spend a lot of time trying to balance your stock between maximising profits and getting rid of trash. I’d like to see a much larger inventory of items released further on down the line. 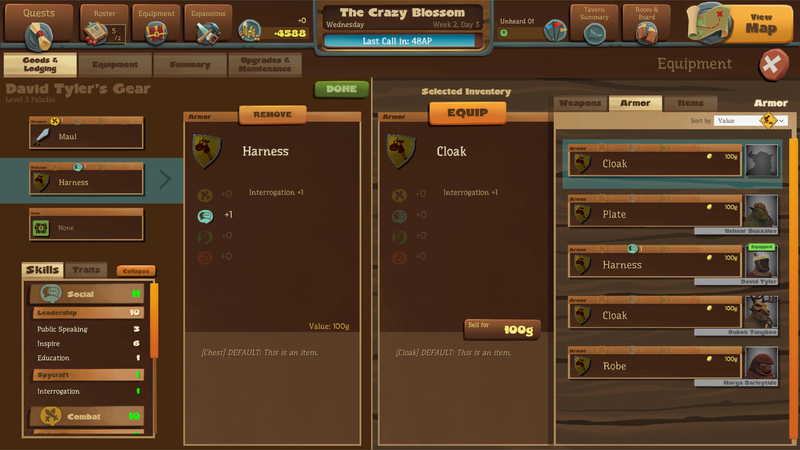 Items with unique boosts to try to discourage just finding and stocking one or two highly profitable items. Making sure that your adventuring parties are well equipped is easy once you start to get items. Each member can equip one weapon, armour and accessory. And you can send out many parties of adventurers each day. Ensuring each parties are well enough equipped to not only tackle the primary quest, but any random side quests too, will soon overshadow your tavern management. Success or failure in a quest often opens up new avenues to explore. So even when your party fail at a time limited quest there’s always something new to tackle when they trudge home. Assuming that they manage to survive. 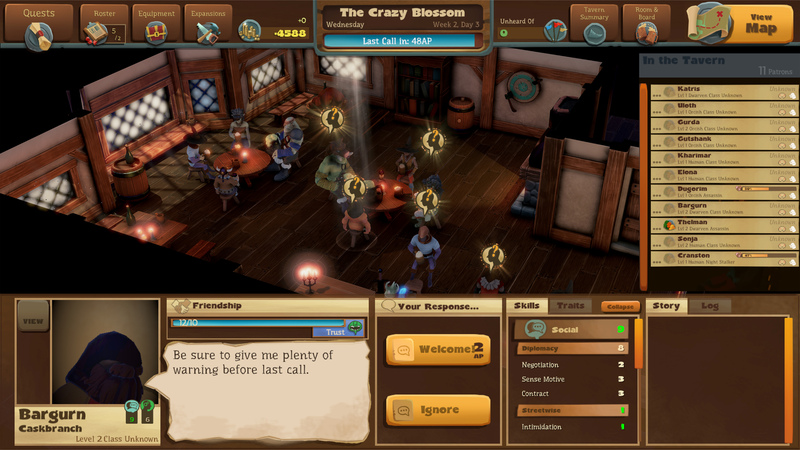 I can recommend Epic Tavern to anyone who’s looking for a witty, light and fun fantasy management game. There are plenty of “X coming soon!” comments in several key areas I’d have otherwise have expected to have been fleshed out. But this is completely forgivable with the raw talent that has been put on display in other areas. With an expanded selection of food and drink items, a stylised UI, Epic Tavern would certainly find itself on my most played games of 2018 list. Especially if there is more of the excellent, almost Lucasart level, writing for the quests and characters. The rather steep entry price of almost twenty pounds is the only real flaw I currently have with this version of the game. If it dropped to say, ten pounds on sale then I would definitely recommend this to anyone who was even remotely interested in the genre. As it is now, I would have to recommend holding off until the game is a bit more further on in development.